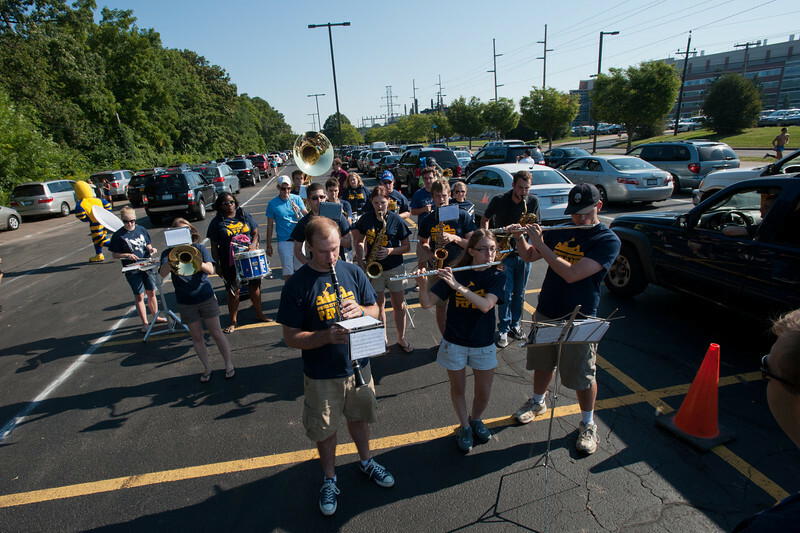 The UR Pep Band entertains carloads of freshmen as they line up in Park lot during move-in day at the University of Rochester on August 23, 2012. WHAT: The University of Rochester’s incoming freshmen class arrives, with about 1,300 students moving into five residential halls on the River Campus and the downtown Eastman Commons Student Living Center at the Eastman School of Music. Move-in day marks the beginning of orientation, a week for students to learn the campus, explore extracurricular activities, and meet the Rochester community before the academic year commences. Throughout the week, students attend information sessions, tours, meet-and-greets, and the annual Wilson Day of service. New this year is One Community, a session for current University students to share their stories with incoming freshmen on the role of identity and diversity in their college experiences. A two-day parent orientation also starts Aug. 26 on River Campus. The orientation includes workshops and seminars for parents to gain a better understanding of dining, public safety, undergraduate research opportunities and other aspects of the University. RIVER CAMPUS MOVE-IN: 9 a.m. to 4 p.m. Tuesday, Aug. 26, at Park Lot, Susan B. Anthony Residence Hall (off of Library Road) and the Quad residence hall buildings (Lovejoy, Tiernan, Hoeing, and Gilbert Halls on Faculty Road, Fraternity Road and Wilson Boulevard). President Joel Seligman, along with deans from the College, will welcome the Class of 2018 to the River Campus during the College Convocation, held at 5 p.m. on the Eastman quadrangle. EASTMAN MOVE-IN: 8 a.m. to noon, Monday, Aug. 25, Eastman Commons Student Living Center (100 Gibbs Street). The day includes a welcome picnic from 11:30 a.m. to 1:30 p.m. for new students and their parents, an information fair at 1 p.m., and a parent orientation at 2:30 p.m.
ABOUT THE CLASS OF 2018: The College of Arts, Sciences & Engineering includes over 1,300 freshmen from across 75 countries. More than 340 freshmen are international students, the largest number of any incoming class. The transfer class includes 110 students. At Eastman, there are approximately 147 incoming freshmen and transfer students combined. FOR MORE INFORMATION: For parking information and assistance with interviews and photos/video of the students on the River Campus, call Rachel Goldstein at 585.276.3693 (office), or at Eastman call Helene Snihur at 585.274.1057 (office)/ 585.278.4743 (cell).